This entry was posted on 1st July, 2011 by Haxnicks. I found that last week I spent a huge amount of my time harvesting my crops, this is one of the most prolific times of the year everything is shouting ‘I’m ready pick me, eat me, store me!’ So by now your redcurrants, blackcurrants and possibly gooseberries should be harvested. You need to pull up any lettuces or rocket that has bolted and replace them by planting out another batch to keep you going through the summer. Some carrots/beetroot may be ready, when they are small they are so sweet and delicious, if you are going to cook them, cook them briefly and the flavour that you get from them will be so much better. You can also use the small beetroot leaves for salads. Keep anything you have in the greenhouse well watered, although limp plants can come back to life after being watered. Watering in the evening is the best time to water as it gives the plants the whole night in which to soak it up. Last week I made, strawberry sorbet with mint, gooseberry fool, and I froze the majority of my broad beans – otherwise they were going to get too big and bitter. 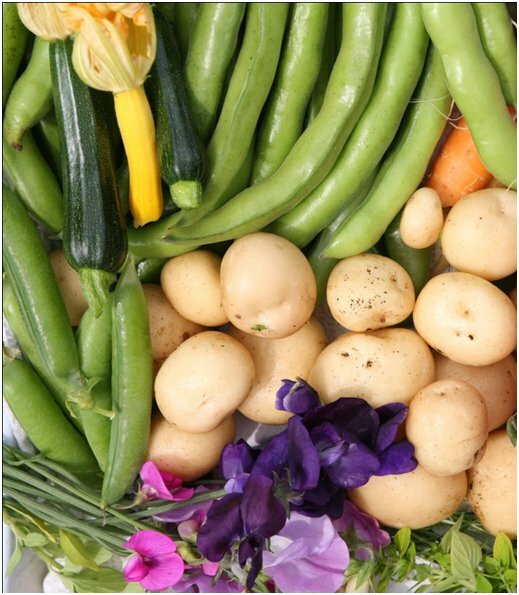 This is a fantastic time of year, the time when all gardeners want to show off their years work, now is the time to make yummy broad bean salads, have warm new potatoes, and summer puddings galore. Weed your patches. Harvest your crops, eat them, share them or store them. Storing – Blanch any peas or beans and put them in the deep freeze. Freeze any berries you don’t have time to eat. You can also freeze elderflowers to make elderflower cordial later on in the summer. Look at your tomatoes and check that they haven’t sprouted any extra branches; otherwise all the energy into making tomatoes will go into making more leaves. So, you do this by looking at the main stem of the tomato, branches should come off that, but only 1 branch. If there are two or more, pinch out the inner branches with your thumb and index finger. Also make sure that the tomato is well secured to the plant support, by using Haxnicks SoftTie. I have had great problems with finding more spinach to sow as it is not readily available like a lot of herbs or tomato seeds are. This is a good time to sow more of these to see you into the autumn. How about another batch of radishes? Go to the garden centre and see what tickles your fancy in the way of seeds, because it would be so nice to have some winter and spring crops too.